Obituary – Smith, Helen (Leighan) « Perry High School Alumni Association, Inc.
Mrs. Helen Leighan Smith, age 23 years, died at the home of her mother, Mrs. Helen Leighan, 824 Grove street at 12 o’clock Sunday (April 6, 1930), following an extended illness of tuberculosis. Mrs. Smith is the daughter of Mrs. Helen Leighan, and was born on a farm near Perry, November 30, 1906. She has lived in Perry most of her life, where she attended the Perry schools and graduated with the class of 1925. After graduation from school, she taught one term of school near Pawnee. Later she entered nurses training at the University hospital at Enid and was in training eight months. On June 7, 1928, she was married to Clayton Smith, and they went to Shawnee where they made their home until August, when she took sick and was brought to the home of her mother. She was a member of the Methodist church here and was active in church work before her illness, which kept her from attending. She has been confined to her bed since last August, but was always cheerful, bearing her pain and suffering without words. 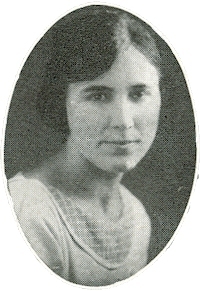 Besides her husband, Clayton Smith, she is survived by her mother, Mrs. Helen Leighan, four sisters, Edith, and Margaret at home, Mrs. Harry Smith of Wichita, and Mrs. Faye Thompson, Perry, two brothers, Curtis at home, and Gilbert of Lyons, Kansas, a host of other relatives and many friends. Funeral services will be held at 2:30 o’clock Tuesday afternoon from the Memorial hall, conducted by Rev. George A. Parkhurst. Burial will be made in Grace Hill cemetery with Fred A. Davis and Son, funeral directors, in charge. Paul bearers will be, Lloyd Brown, Paul Harding, Orville Foster, John Lau, Charles Hirschman, and Dorance Barnes.